Michelle Ward had the pleasure to speak to the legendary singer, Bonnie Tyler, about her incredible new album and tour. 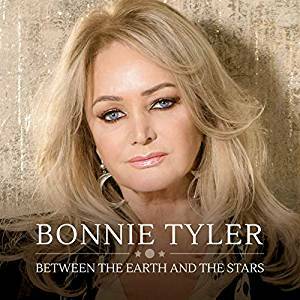 Bonnie Tyler’s 17th album, ‘Between The Earth And The Stars’ is out now and has already appeared at number 34 in the album chart. The album has 14 original works and duets with Sir Cliff Richard, Sir Rod Stewart, Francis Rossi and with songs written by Sir Barry Gibb and Amy Wadge (C0-writer with Ed Sheeran). Bonnie and her band are about to embark on a 24 date tour of Europe with her classic songs and a few of the new tracks too. The London Palladium Gig on the 18th September might see a surprise guest but dont hold me to that! I really enjoyed talking to Bonnie, she is so warm and friendly, you can imagine sitting and chatting with Bonnie all night about music. You can hear in her voice how much she loves getting out there and gigging. Her band, she says, are like a family, having played together for over 20 years.